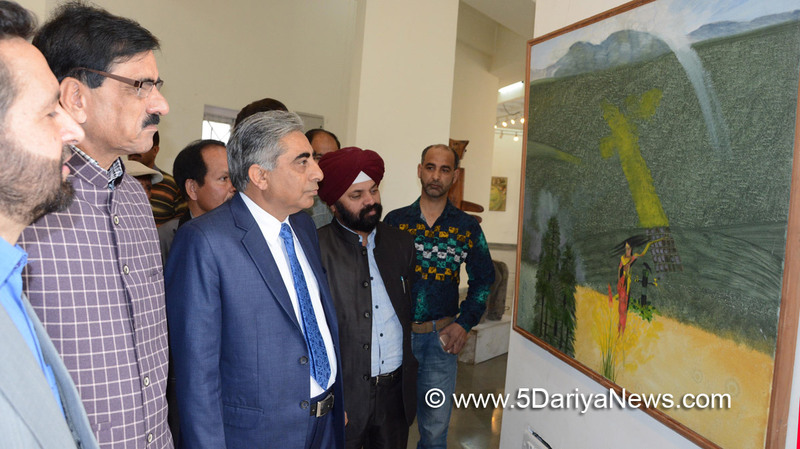 Minister for Agriculture, Ghulam Nabi Lone Hanjura inaugurated contemporary painting Exhibition, organized by the Jammu and Kashmir Academy of Art, Culture and Languages (JKAACL), under its 3- day’s cultural festival at Kala Kendra here today.Speaking on the occasion, the Minister emphasized on developing the art, culture among younger generation to preserve the treasure of JK’s cultural and literary art.Hanjura said that the younger generation can express themselves through various forms of art whether it’s a play or a painting, poetries, songs, films, stories and many more alike and by inculcating the traditional and ethnic values, the powerful tool of art can be used to its optimum in promoting the state’s cultural heritage.The Minister keenly viewed the paintings and sculptures displayed during the exhibition and described these paintings as treasure of art. The Minister appreciated the Academy for nurturing the local talent by regularly organizing cultural activities in all the three regions of the State and called for organizing more programmes on the lines of the ongoing Literary and Cultural Festival aimed at promoting the art and culture sector.He asked the parents to inculcate love for mother tongue and its practice in children's and engage them for its promotion to preserve the local languages of the state.While speaking on the occasion, Secretary, JKAACL Dr Aziz Hajini said that Academy is continuously organising such events across the state to promote and preserve its cultural heritage. He also added that academy will establish Art gallery in Kashmir soon. Later, Dr Hajni presented vote of thank to the Minister and other dignitaries for gracing the occasion.Additional Secretary JKAACL Dr Arvinder Singh Amn, Chief Editor JKAACL, eminent artist Bihari Lal besides senior functionaries of JKAACL and several prominent artists, writers and poets were present on the occasion.